Welcome to the Fall Release! Dear Friends, Ten years ago, few friends would take me up the invitation to visit us in Casablanca. Admittedly, Chile is a long way away from much of the world. The flights to Santiago were barely half-full (this had its benefits: I depended on my “C” seat always becoming “C+D+E” for the overnight flight). But in 2011, the New York Times named nearby Santiago #1 in its “Places to Go in 2011,” and then National Geographic Traveler praised our neighboring Valparaíso in its “Best Trips 2013.” Things changed. To order wine, please visit our website. Old Corral Club members receive advance allocations of their personalized wine selection, a 10% discount on all orders, and complimentary tastings in Casablanca. To join the Corral, please call us to learn more or sign up online. We also offer free shipping on one case or more. We only send release letters twice a year, but on our blog, Facebook, Twitter, Google+ and Pinterest you can get more frequent updates on Kingston. Read the latest on our harvest, hear the birds in the vineyard, and get travel recommendations for your next trip to Chile. This fall, we’re releasing our newest Pinot Noirs and Chardonnay, including the 2012 Alazan Pinot Noir ($32) and 2012 Tobiano Pinot Noir ($20). Old Corral members will also enjoy exclusive bottlings of the 2012 Alazan CJ’s Barrel Pinot Noir ($38) and the much anticipated 2012 Sabino Chardonnay ($24). 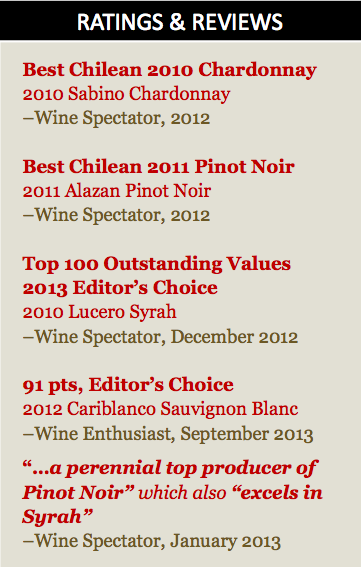 We hope you enjoy drinking these wines as much as we’ve enjoyed making them. Sending our family’s best from Casablanca, and we’ll look forward to welcoming you south someday soon.